Celebrity Cruises offer a true taste of modern luxury onboard elegant and classically designed ships. 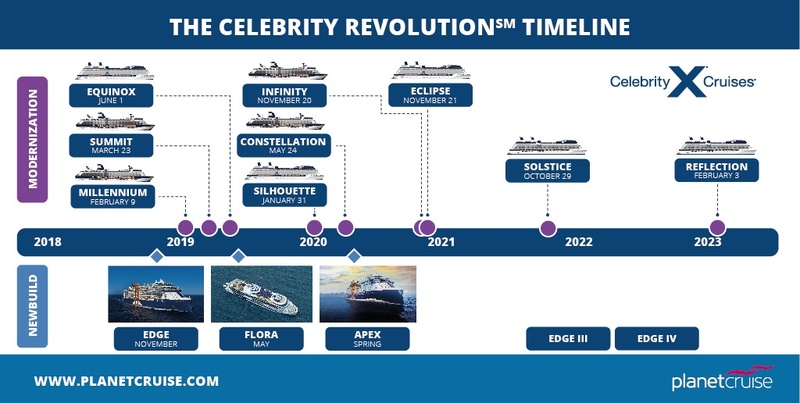 Celebrity Edge, the newest Celebrity ship, defines all that Celebrity cruise line stand for and has now finally been unveiled to join the rest of Celebrity's fleet of classy ships. To celebrate this much anticipated point in the cruise line's proud history, lucky passengers are now able to book their place to be one of the first to experience a cruise onboard this revolutionary ship. With a crew to guest ratio of 1:2 you can expect an exceptional level of service and luxury facilities throughout. With their elegantly modern surroundings, innovative features and mouth-watering cuisine, Celebrity ships have everything you need for the cruise of a lifetime. Days onboard can be spent exactly how you wish with a range of services available when sailing through the Mediterranean, Caribbean or any number of the diverse destinations offered. Whether you like to take part in activities or simply relax by the pool, the choice is yours. Famous for their evening entertainment, Celebrity Cruises welcome the American Ballet Theatre onboard their fleet of cruise ships from 2019 onwards to dazzle audiences on a range of sailings. For those that like to keep active, you can enjoy games at the top deck lawn club or enjoy a game of paddle tennis in the country club style surroundings. Take a personal training session in the gym or join one of many fitness classes. For the more relaxed traveller, there is a range of tranquil areas for you to catch some rays or read a book. The Canyon Ranch Spa offers some of the best relaxation and revitalisation at sea, providing a range of relaxing treatments from massages, to facials and pamper sessions. Unique features like the real grass lawn on top deck and the cool martini ice bar set this cruise line apart. Enjoy an atmosphere of modern luxury whilst you sail to invigorating destinations for a different view. With a range of comfortable and luxurious staterooms, from cosy inside cabins to spectacular suites. You can relax knowing that there is the ideal match to suit your needs, creating a sumptuous home away from home at sea. Celebrity Cruises enhanced Concierge Class provides ample benefits from extras such as a pillow menu, an expanded room service breakfast menu, complimentary shoe shining and much more. Concierge Class guests can also enjoy priority check-in and disembarkation, an exclusive Destinations Seminar and a dedicated team of professionals catering to your every need. Celebrity Cruises Concierge Class is so much more than a room, it's an experience. Meanwhile, loyal Celebrity Cruises guests can benefit from a whole host of exclusive rewards by joining the Captain's Club. Members receive Celebrity Cruises updates, club discounts and much more. Captain's Club members can still get their rewards when booking with Planet Cruise. Celebrity Cruises travel to an extensive range of exciting destinations, offering unique experiences and awe-inspiring views of the world. Celebrity Cruises also offer a range of no-fly cruises from Southampton, as well as fly cruises and cruise and stay options. A limited number of pagers are available onboard for carers of those with a disability, special needs or allergies. 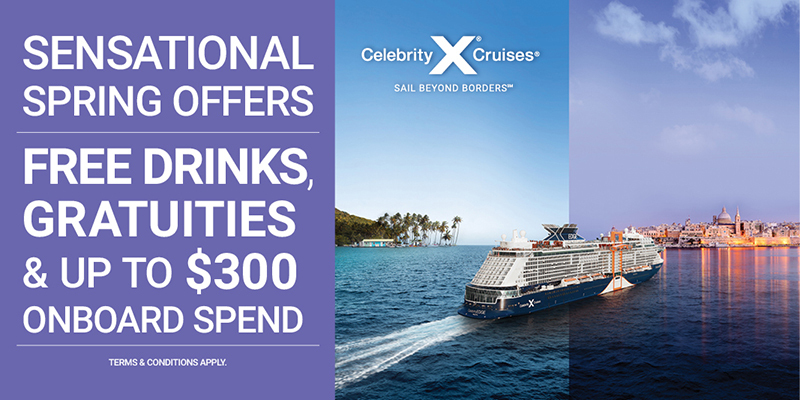 Don’t miss our amazing Planet Cruise Spring Sale with Celebrity Cruises! Celebrity Cruises are known for providing some of the best food at sea, dining is in itself a culinary voyage of discovery. Main dining rooms are chic and contemporary with menus that are kept as fresh as the food. Speciality restaurants offer something extra for that special occasion or a holiday treat. Complimentary casual dining maintains the highest celebrity standards and caters to your every need from early lunch to late into the night. Celebrity Cruises’ main dining rooms are chic and contemporary and offer world-class cuisine paired with exceptional service. Celebrity Select Dining offers flexible dining allowing you to dine whenever you wish between 6pm and 9.30pm. Day-by-day reservation is also available for those who would like to book their table in advance. Oceanview Café – available for lunch and dinner, offering culinary delights from all across the globe. The Aquaspa Café – Spa-inspired restaurant with flavoursome and healthy offerings. Pool/Mast Grill – casual dining experience offering poolside light bites with a relaxed ambience, music and entertainment. Tuscan Grille – traditional Italian steak house. Indulge in favourites such as juicy steak with creamy Parmesan polenta. Qsine – interactive dining experience with flavours from all around the world. Familiar favourites include sushi lollipops and popcorn fish. Available on Celebrity Eclipse, Celebrity Reflection, Celebrity Silhouette, Celebrity Infinity, Celebrity Millennium, Celebrity Summit. Silk Harvest – Asian restaurant with tastes from China, Japan, Vietnam and Thailand. Try the salt and pepper squid with the Kund Pao chicken. Available on Celebrity Equinox, Celebrity Silhouette and Celebrity Solstice. The Alcoves – cabana-style outdoor restaurant on The Lawn Club. Choose a themed picnic basket from one of the delectable Celebrity speciality restaurants. Available on Celebrity Reflection and Celebrity Silhouette. Lawn Club Grill – grill your own meat and seafood in the open air. Available on Celebrity Reflection and Celebrity Silhouette. SS Normandie – contemporary French eatery in a glamorous Art Deco setting. Gastronomic pleasures include are grilled milk-fed veal chop or Celebrity’s infamous Five Senses menu. Available on Celebrity Summit. Luminae – exclusively for Suite Class guests, with delicious meals created by Michelin star chef Daniel Boulud. Celebrity Cruises offer a family-friendly luxury cruising experience. With youth programmes to suit all ages and dedicated ages, the whole family is catered for. Interactive group for under 3s to interact one another, with fully qualified Fun Factory staff members. Hosting activities for children and teenagers every day from 9am – 10pm; the Fun Factory provides an immersive environment in which children can interact with their peers with fun-filled and enriching activities. Activities include games, sports, crafts, music, karaoke, treasure hunts, theme parties, movies and much more. Celebrity offer a vast array activities for the young adults aboard. Youth Counsellors will be organising social and sporting activities along with teens-only late night dances. The newest gaming consoles and titles are available in the teen hang-out area. Babysitting services are available at $19 an hour for in-stateroom babysitting, for up to three children within the same family.